1 in. 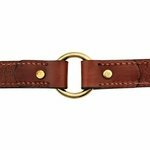 Mendota Hunt Dog Leather Center-Ring Safety Dog Collar. $29.95. "I've had this collar for almost 3 years. It is sturdy and wears well, and looks better now than when new." I've had this collar for almost 3 years. It is sturdy and wears well, and looks better now than when new. I always get comments regarding what a great looking collar. I actually had someone ask about the collar from a picture posted on facebook! The price is excellent, especially with the ID tag. "Still in great shape after over a year of constant wear, including in the field and on the water." Love it! Still in great shape after over a year of constant wear, including in the field and on the water. A little saddle soap to clean and it is good as new! "Very well constructed. Has held up well over a year now." Very well constructed. Has held up well over a year now. "This is my 1st experience buying from you, and I have to say it's a superior product." This is my 1st experience buying from you, and I have to say it's a superior product. The quality of this collar is fabulous. I would highly recommend this collar to everyone who needs one. My husband and I feel it's a remarkable value. German Short Haired Pointer. Hunts. Family pet. This collar is AWESOME!! I definitely recommend it!! "The collar is very high quality made." Excellent customer service. We were concerned about the sizing for Charley, our German Shepherd. I called customer service, and they were most helpful with my questions. The collar fits her perfectly. We received it within a week of our order. It looks stunning on her. The collar is very high quality made. If I needed to order another collar, I would definitely order from GDS again! "Good, solid and attractive collar." Good, solid and attractive collar. "Looks great - lots of compliments." Looks great - lots of compliments. Looks great with the matching 4ft lead (which has a brass ring on the looped handle so that I can convert this to a 2ft lead). "I am very pleased with the collar and the quality of it." I am very pleased with the collar and the quality of it. These collars are wonderful! Our working dogs look professional when on the job. "It fits very well on my 42lbs gsp." It fits very well on my 42lbs gsp. Very neat looking along with being rough and tough! You guys are the best, thanks. Sooo nice. Will order more. 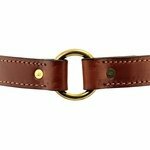 Was nervous ordering a collar online from a new company, thinking it was going to be made really cheap. When I received the collar it blew me away. It was made very sturdy and was exactly what I was looking for. Great quality. I would definitely buy again. I LOVE the collar, good quality. The ring stays at the top, so it's easy to attach the leash. I love it, and so does my dog Oliver. Looks nice and functions really great. "For the money, I doubt there's anything better out there." For the money, I doubt there's anything better out there. Quality craftsmanship. "This collar is a true quality item." This collar is a true quality item. The price is well worth the product! Very impressed with this collar and will be the only collar I purchase from now on. We've gone through many collars before, but this collar has been the best by far. It has last longer and looked better than any collar we've purchased at our local pet store. Would highly recommend it. The collar fits Cooper very well, though he is on the last notch, so I think it runs slightly small. The stub of the collar kind of pokes out, and because of the shape of the buckle (the bend faces outward instead of along the curve of the neck), it won't stay underneath the ring. That being said, the collar looks great! Will probably pick a different model because of the buckle next go-around though. "LOVE the look of this collar on my dog!" LOVE the look of this collar on my dog! Great quality, nice thick leather and nameplate looks great and tons of room for info. When Holmes outgrew his first Gun Dog Supply collar, we knew we wanted one exactly like it (just bigger). The collar is gorgeous and different, and he always gets compliments on it. He had his old collar for 2 years. It is amazing how soft the leather was compared to his new one, but he's already started breaking it in. They really do get better with wear! You guys rock! Great product fast delivery. Very well made collar. I purchased this collar for my dog to wear during herding classes. 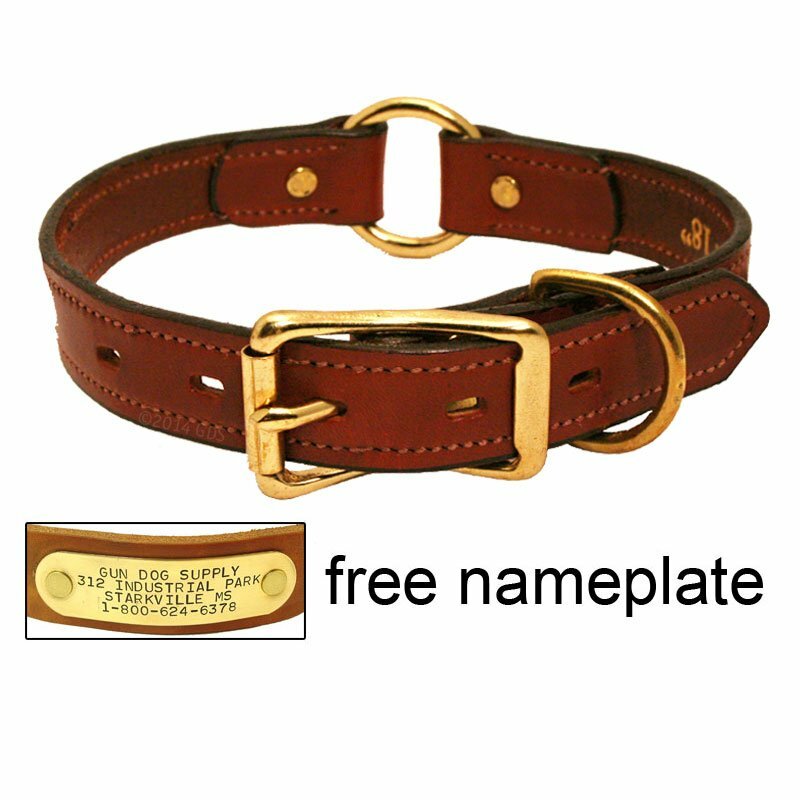 Bonus is the brass name plate that is nicely attached to the collar, so no dangling tags. Beautiful collar and very well constructed. I couldn't be more pleased. These collars are great. I have had the regular one for 7 years, so I decided it was time for a new collar since the brass ring has worn out where I attach the registration and rabies tag. So I ordered 2, the D-ring for use only during hunting season and regular for everyday use. As they say.. You get what you pay for, a quality collar!!! "Just as good as I expected!" Just as good as I expected! "I love gun dog supply's leather collars!" 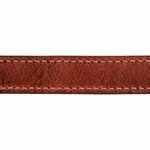 I love gun dog supply's leather collars! I work at an animal hospital and my dog goes everywhere with me, I get so many compliments on his collar. I tell everyone to get there collars from gun dog!!! "The collar is great and looks awesome on Hoss the Boss!! " The collar is great and looks awesome on Hoss the Boss!! Thank you for making such a well made leather collar. It's a pleasure to do business with your company!! "Great and my customers love it!" Great and my customers love it! Just as described, great quality. We love it!! We also got a matching leash. "Great quality, will last forever." Great quality, will last forever. English Setter. Hunts. Family pet. "Probably the best collars on the market." Probably the best collars on the market. My dad started buying these almost 40 years ago, and every dog he's owned and I've owned has worn one. "High quality, durable, and great looking." I ordered two collars, one for my dog and one for my sister's. I absolutely love them. They are high quality and very sharp looking. 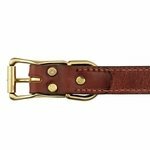 I searched the internet for leather dog collars that could be personalized and the Gun Dog site had the biggest selection for the best prices. High quality, durable, and great looking. "Good looking and serves its purpose." Good looking and serves its purpose. This is my second Mendota Collar for my dog. I also have your synthetic collar for water work. I ordered the same size that she has been wearing (18), and the new Mendota is about 1 full inch shorter than the original one. Have to use the last hole in the collar while I prefer the center hole as the original collar. What do you suggest? Seems to run to the large size when ordering. "This is my third collar, and I like it very much." This is my third collar, and I like it very much. The fit is good, the look is nice, and if not for changing information on the collar, I would still have the first one. Excellent product and fast shipping. 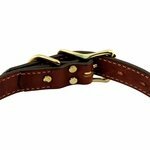 "Great collar and sizing advise was perfect." Great collar and sizing advise was perfect. "The service from this company and the products has been excellent." The service from this company and the products has been excellent. I encourage anyone to use this company. It's a beautiful collar. Holding up well so far to whatever my very active pup throws at it. The brass ID plate is great, too. Feels secure, etc. I usually use a second collar or a harness to attach a leash to, so I can't really attest to its full strength, but it seems durable and well-made. Service was great overall, shipping prompt, and product description spot on. "Fantastic quality. Exactly as described." Lab / Terrier Mix. Family pet. Fantastic quality. Exactly as described. Fast shipping. One word of caution. Despite very good sizing directions, I found the collar fit tighter than expected. I think it was the switch from a flexible collar to a stiffer leather collar. Give consideration to going with next larger size if you are doing the same. "Good value. Excellent to do business with." Good value. Excellent to do business with. "Great looking collar. Really strong, and I would buy another one!" Great looking collar. Really strong, and I would buy another one! "Excellent quality and nice color. Not as stiff as I expected." Excellent quality and nice color. Not as stiff as I expected. However, the center ring of the 20" is too large for the clasp on my large lupine brand leash, so I have to use the D ring. A great value. "Very handsome collar on my male Vizsla. Well-made, looks like it will last a lifetime." Very handsome collar on my male vizsla. Well-made, looks like it will last a lifetime. I like the look of the brass nameplate, and that it bends easily to conform to the curvature of the dog's neck. Good quality at a great price. "I wasn't expecting my dog collar to come so fast, and I love the color." I wasn't expecting my dog collar to come so fast, and I love the color. "Excellent collar and arrived fast." Excellent collar and arrived fast. "It is a great collar." It is a great collar. "Excellent quality and fast shipping. Will buy from again." Excellent quality and fast shipping. Will buy from again. "My dogs both love them so much. If I take them off, they will get them and place them at my feet to put them back on." Best collars since sliced bread! My dogs both love them so much. If I take them off, they will get them and place them at my feet to put them back on. Would never buy any other collar. "High Quality Collar! The reddish brown color looks amazing on my Vizsla." High Quality Collar! The reddish brown color looks amazing on my Vizsla. I would buy another for sure! "It was a little stiff when I got it, so I rubbed it down with a fair amount of olive oil, that's an old saddle makers method, and it softened nicely and took on a rich chocolate color." 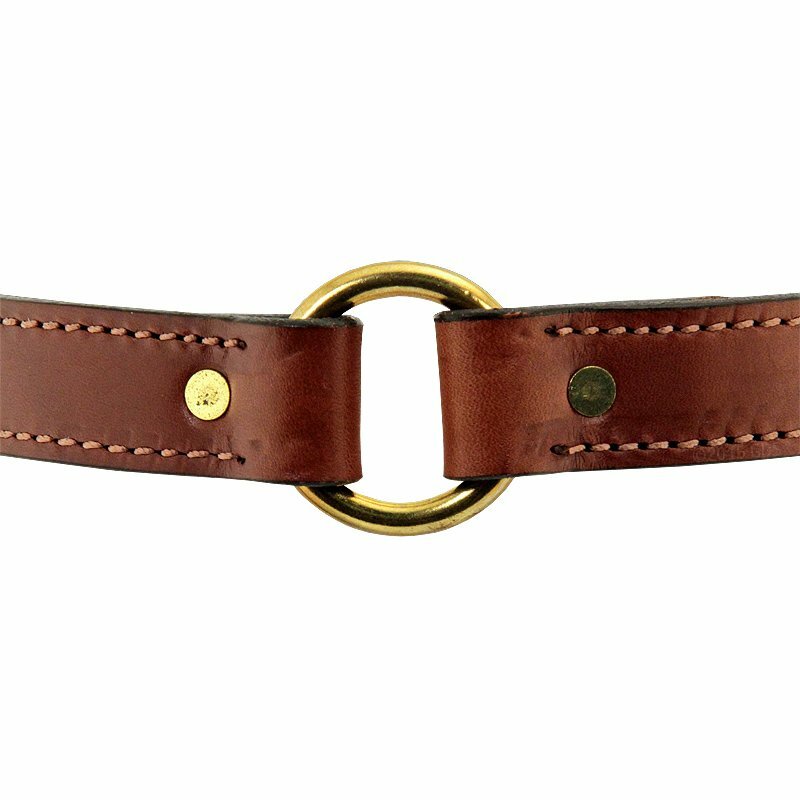 I had seen this type of collar before and did an online search for one. 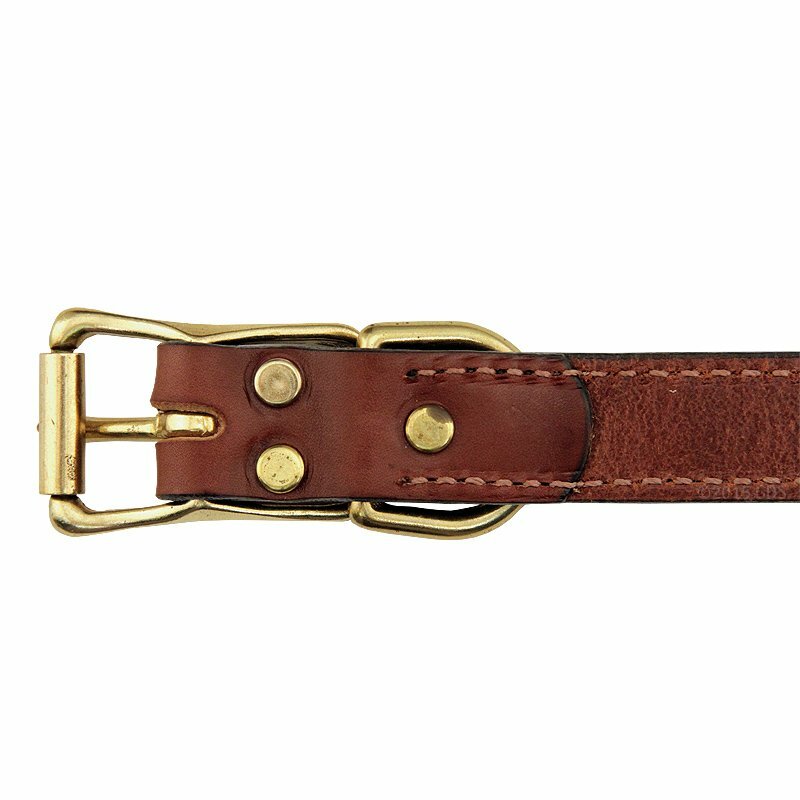 Sometimes you'd like to hold things before buying, but I can say this collar is excellent in leather quality, thickness, buckle, rings, and nameplate. Fits Sadie (18") perfectly and conforms well. It was a little stiff when I got it, so I rubbed it down with a fair amount of olive oil, that's an old saddle makers method, and it softened nicely and took on a rich chocolate color. I'd buy it again without hesitation. 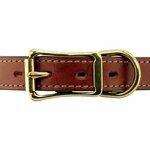 "Best leather collar on the market." 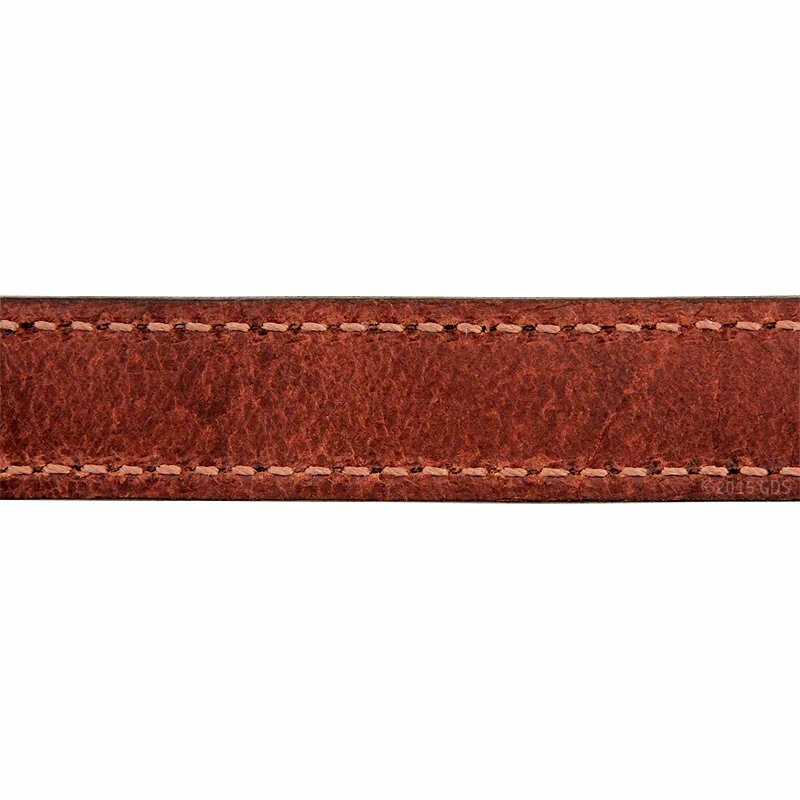 Best leather collar on the market. "Great quality collar. Double stitched with good quality hardware." Great quality collar. Double stitched with good quality hardware. Measurements were dead on!! This collar will be around for a long time! "Quality construction to last a lifetime." Quality construction to last a lifetime. "Stylish leather. I love my new collars." Stylish leather. I love my new collars. "Love the collar. The turn around time was excellent." Love the collar. The turn around time was excellent. Thanks! "Now when my Flock goes for "Walk About", Animal Control will know where they belong!" Beautiful. Fits fine! Now when my Flock goes for "Walk About", Animal Control will know where they belong! Was a bit more reddish than expected, but still love it. I know it will patina really nicely. Very pleased. Awesome quality and for a great price! "A truly handsome collar option to what you can get in a store." I LOVE these collars! I have two lab puppies (5 & 6 months), and they are better than Houdini at escaping from ANYTHING! These collars work great because they have all the information right there on the collar. I never have to worry about Lilly ripping Luke's tags off or visa-versa. Plus, they get so many compliments. A truly handsome collar option to what you can get in a store, like Petsmart. However, the only down side I have had so far is that when I measured my dogs necks, I got that they had a 17 inch neck and the 16 inch setting is a little looser than I would like, but they are puppies, so they'll grow some still! Thanks GUN DOG SUPPLY!!! Very nice collar. The engraving was a wonderful added touch. Fast shipping!!! Best dog collar around! Great price too. High quality. Labrador Retreiver. Hunts. Family pet. This collar is awesome!! 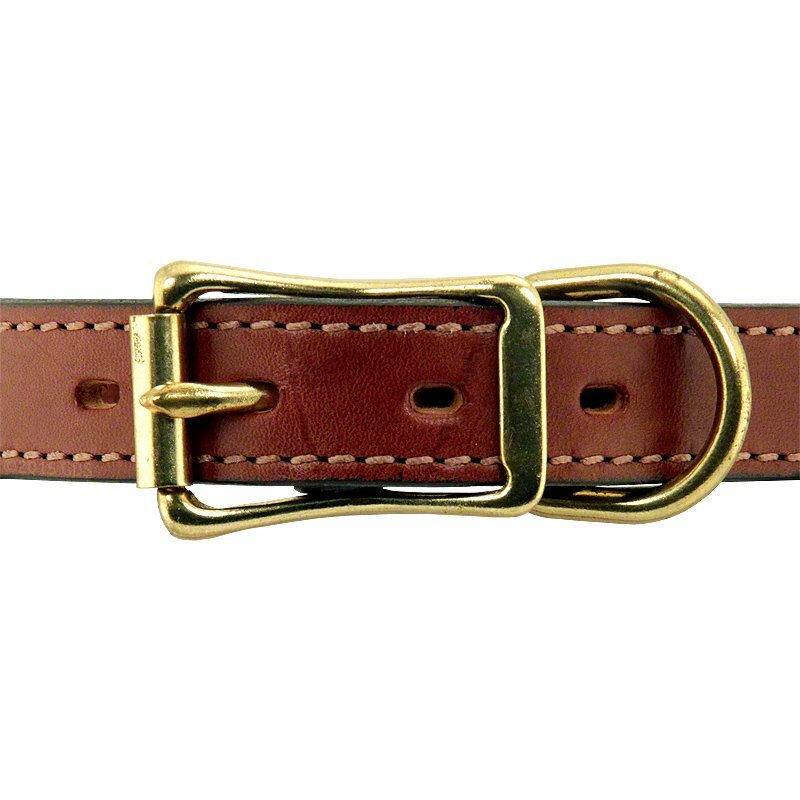 Great looking high quality leather and metal buckle. The name plate is awesome as well. And it only took 3 days from order to delivery!! "Looks beautiful on my dog's golden fur." About 10 days since I got this collar, and I love it. Looks beautiful on my dog's golden fur. "Very solid construction and feels very durable." I can't vouch for it as a hunting collar since our roughest use is going for walks, but it certainly looks the part. Very solid construction and feels very durable. Looks fantastic, too. It's very pretty and strong collar! I love the color! "Looks great, fits perfect, and shipping was fast." Looks great, fits perfect, and shipping was fast. Awesome customer service at Gun Dog Supply! If my dog ever needs another collar, I'll be ordering it from Gun Dog Supply. Great looking collar. Used the size instructions from your web site, and both collars fit exactly as advertised. Beautiful American made leather collar with an easy to read name plate. Will last for years! "This collar looks great on Hank." This collar looks great on Hank. Arrived quickly, was well packaged, and I love the name plate. I would describe the color of the leather as slightly reddish, which looks really good against his light tan coat. I think he's pretty pleased with it as well! He's an adventurous pup, so far it's holding up very well, and I'm looking forward to no more smelly nylon collar! "Top notch product for quality and function." Top notch product for quality and function. At field trials I'm frequently asked about quality and where to purchase. The response, of course, is Gun Dog Supply for all of my dog and trial needs! "I have purchased several of these over the years, and they are great." I have purchased several of these over the years, and they are great. They hold up well. I only had to replace the last one because my dog encountered a skunk, and thus the collar doesn't smell very good now. Great product. It shipped super fast and arrived in time for our dog's first birthday. Best quality and value! These collars last forever(unless your puppy chews them). "This collar fit our guy great." This collar fit our guy great, and we couldn't be more impressed with the quality! "Phenomenal product and fantastic customer service." Phenomenal product and fantastic customer service. Ordered it on a Monday came on Wednesday! Will definitely be back! "Super fast delivery and great collar for the money." German Shorthaired Pointer. Hunts. Competes. Love the collars so far. One of them came with a loose stitch that broke free before I knew about it, but I just melted to collar and reinforced with a dab of super glue. I still think these are solid collars so far and would recommend them for the price. I really like the collar, but found my dog is between sizes with the smaller size collar being too small, and the size I ordered has to be buckled in the very last notch, which leaves a long length of collar sticking out the ring. Other than this size issue, we really like the collar. I'd like it more if it was the right size. Can't find my order to see if I messed up, but it won't fit a lab. Oh well, if you're going to be dumb, ya gotta be tough. Works pretty well for our 20 month old 85# GSD to assist with his training. West highland terrier. Family pet. It may be too big for a westie. Owner error. The collar is fine, just looking for a not so wide one. I use them in photography and don't like the look of the collar being so wide. The leather is stiff and lower quality than I expected. Sewing job rather poor. D-Ring way too close to the buckle. 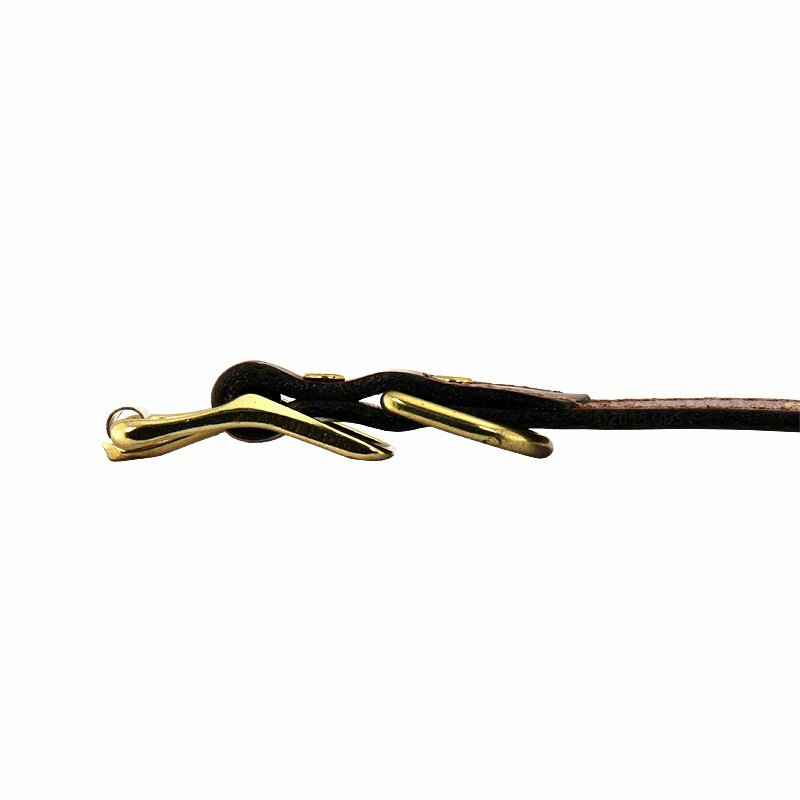 The angle on the clasp resulted in a very loose securing of the tail of the collar. As a result, my too-"intelligent"-for-his-own-good GSP managed to repeatedly unbuckle the collar himself. After removing it himself this evening he decided to chew through the collar so now he has neither a collar or tag. I used the sizing recommendations against my better judgement. It was too small for the dog. The D ring is too large and positioned so that it wedges under the latch. 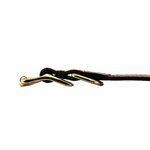 This causes the latch to stick out and catch on furniture or brush while hunting, which is unsafe for the dog and furniture. I am paying someone else for another collar. I left feedback about the problem and heard nothing back. Lesson learned about Gun Dog Supply. Emailed 10/25/2013 Thanks for contacting Gun Dog Supply. Sorry you had trouble with the collar. We will be glad to replace it or issue you a refund. Sorry also that no one got back to you. I do not see where you contacted us. Where did you leave the feedback on the collar issue so I can see what happened? Please let me know if you have any questions. We do appreciate your business. This leather Hunt Collar is a must for the distinctive working dog. Great looking and extremely durable. Center "safety" ring relieves pressure when caught on an obstacle and is also a handy place to attach a lead. 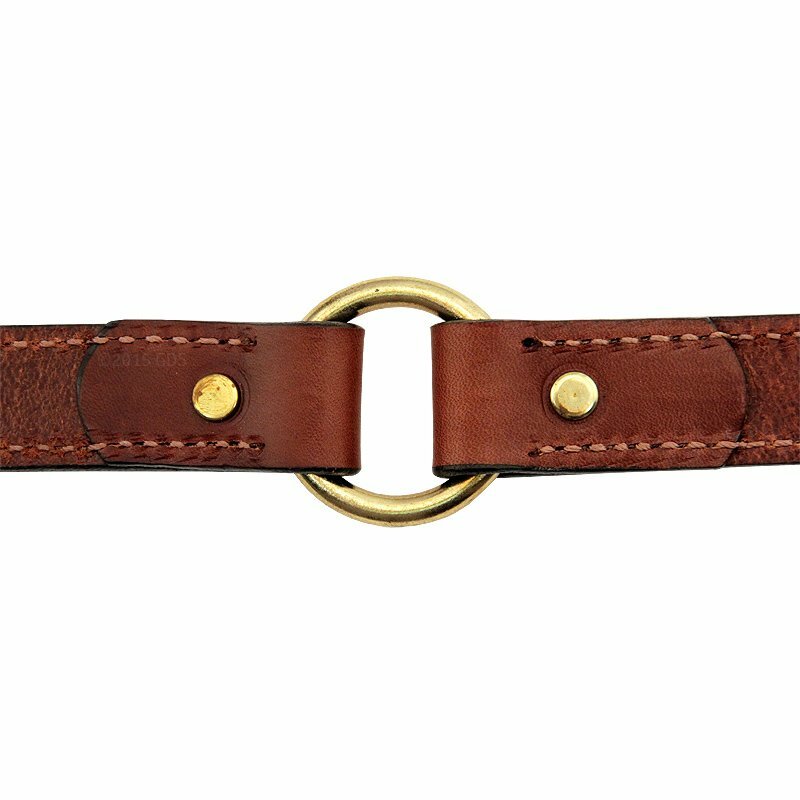 Fully stitched design with solid brass roller buckle, center ring and dee ring. Made in the USA. WARNING: This product can expose you to chemicals including Lead and Lead Compounds, which are known to the State of California to cause cancer and/or birth defects and reproductive harm. For more information, go to www.P65Warnings.ca.gov.